I’ve been working with buttercream a lot this year, but mostly for cute small Smash Cakes. 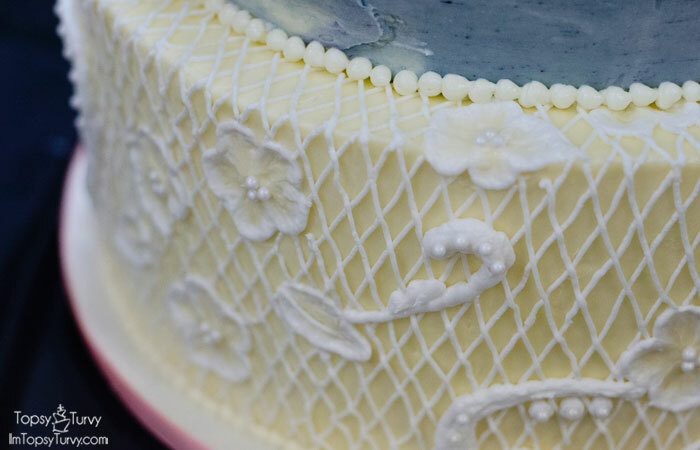 So when I got a request for a Buttercream lace Wedding cake I was so excited! I’m a bit out of practice, so it took longer to hand pipe it all, but it was worth it! The bride was wearing a vintage lace wedding dress, so they sent me this picture, told me the colors were white, ivory and blue and her main flower was a peony. And they were decorating in lace and pearls. Other than that I was able to design the rest myself. The dress has a lighter lace, with thicker lace applique pieces added with pearls. 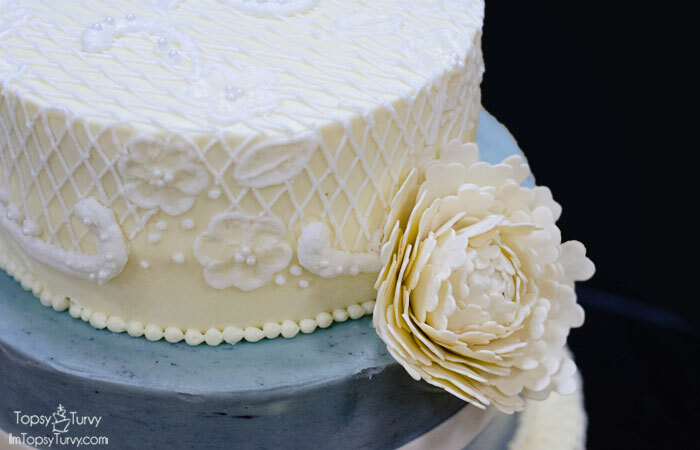 I decided to create a lace grid on the top and bottom tiers, I left blank flower shapes as well as left some of the bottom area of the top tier blank so it wasn’t too much lace. Then I used brush embroidery to add flowers and leaves. 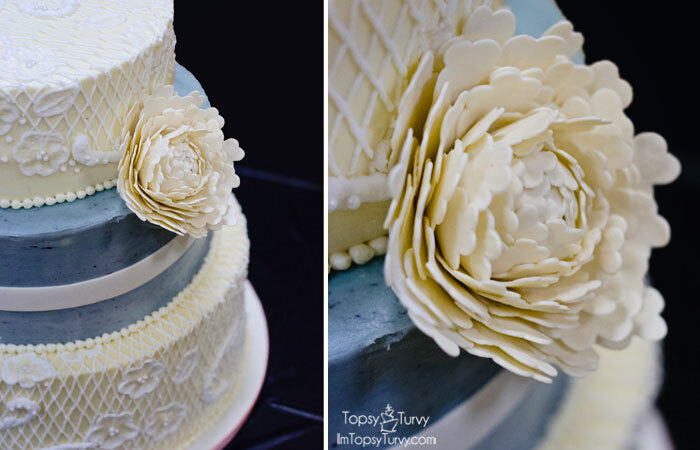 Then larger swooping details around the bottom of the lace in the top tier, as well as around each cluster of flowers. 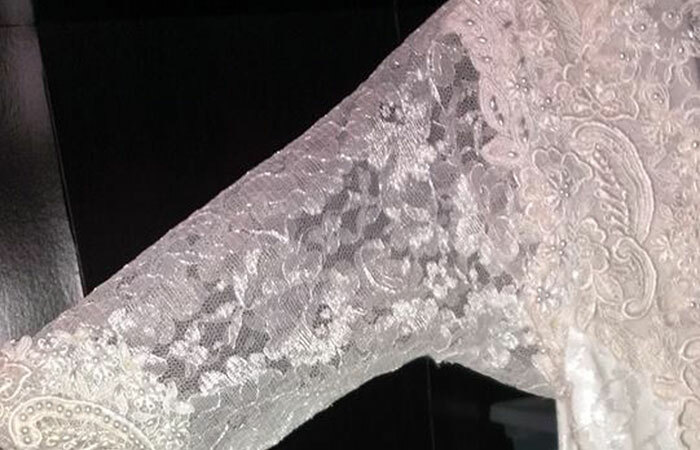 Then I added some edible pearls to teh swoops to match the thicker lace details on the edging of the dress! I also added edible pearls to the center of each flower. I wrapped the center tier with a strip of white fondant. I thought about adding a bow, but the large gumpaste peony was large enough I left it as just a band. 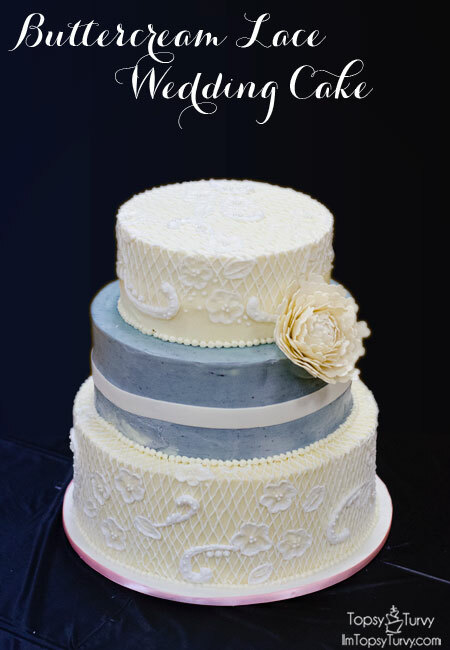 After I stacked it I added a small buttercream bead border on every tier. Finally I made my own gumpaste Peony! I’m teaching how to make these peony’s and my large gumpaste roses next month at Orson Gygi’s if any of you locals are interested! That was my cake! Beautifully done! thank you so much! it did turn out nice. You are amazing! I’m telling everyone! awwww thank you so much! I’m very flattered.